Truckee senior Ava Seelenfreund drives to the basket against Churchill County during the Class 3A Northern League semifinals. Seelenfreund was named first-team all-league and first-team all-state for her play this past season. Several athletes from Truckee and North Tahoe stood out as among the best basketball players in Northern Nevada this past season. From standout individual performances to propelling programs to their best seasons in several years, a number of the Wolverines and Lakers’ top players were selected to all-league and all-state lists. 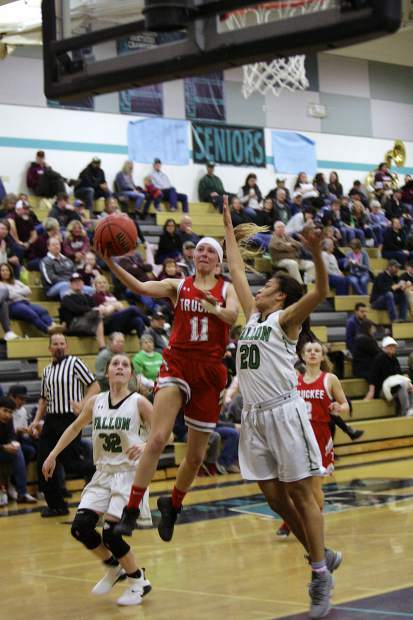 The Truckee girls’ basketball team took a big step forward as a program this past season, picking up the school’s first postseason win since the 2010-11 campaign with a squad compromised largely of juniors and underclassmen. The girls’ 20 overall wins were the most for the program in more than a decade. Ava Seelenfreund, who was one of three seniors on the roster, led the way for the Wolverines with 12.8 points per game and 4.1 steals per game. For her play this past season, Seelenfreund was named first-team all-league and first-team all-state. Sophomore Annika Thayer was a force in the post all season long. Thayer averaged team highs with 8.5 rebounds per game and 2.5 blocks per game. She also scored 9.3 points per game for Truckee. Thayer was named second-team all-league for her play this season. Junior Elena Friedman proved lethal from beyond the arc, knocking in 47 3-pointers on 35 percent shooting this past season. Friedman was named to the Northern League’s honorable mention list. Truckee Head Coach David Shalvis was named the Class 3A Northern League coach of the year. The Truckee boys’ basketball team had a tough run in league play this past season, finishing the year 3-15 for a ninth-place finish in the Northern League. Sophomore Ethan Flynn led Truckee in scoring this season at 13.3 points per game and was named to the league’s honorable mention list. Truckee junior Isaac Cruz scored 11.0 points per game and was also named to the league’s honorable mention list. This past season, the North Tahoe boys’ basketball team earned the program’s first state tournament berth since 1998. Junior John Zapata emerged as one of the best centers in all of Class 2A this year, averaging team highs with 1.5 blocks per game and 7.4 rebounds per game. Zapata also scored 8.9 points per game for the Lakers. For his play this season, Zapata was named second-team all-league and second-team all-state. Senior Liam Bickett-Walsh averaged 8.0 points per game and dished out 2.3 assists per game for the Lakers, earning second-team all-league honors. Senior Ricardo Martinez was one of the team’s best defenders, averaging a team-high 1.4 steals per game to land on the Northern League’s honorable mention list. The North Tahoe girls’ basketball team had a tough run through the Class 2A Northern League this past season, finishing with a record of 2-13. Sophomore captain Alicia Lee earned second-team all-league honors. Senior captain Merrill Green was named to the league’s honorable mention list.